TL;DR: Many AngularJS 1.x developers are interested in Angular 2, but the major differences between versions 1 and 2 are daunting when we have so many Angular 1 apps already in production or maintenance. In Part 1 and Part 2 of this tutorial we set up our Angular 2 app, migrated the basic architecture, routing, API, and more. In this final installment we'll finish our app! 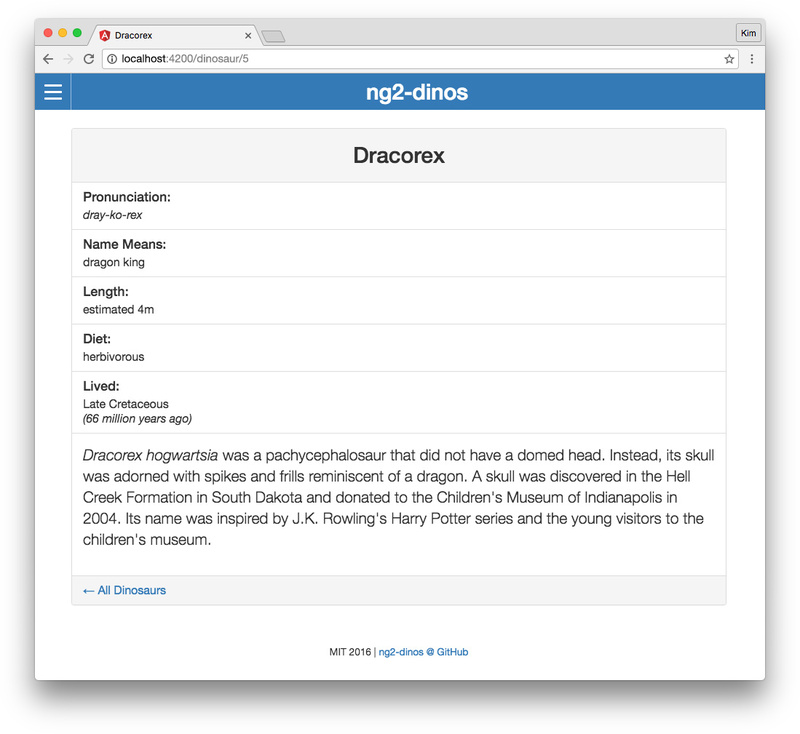 The final code for our Angular 2 app can be cloned from the ng2-dinos GitHub repo. In Migrating an Angular 1 App to Angular 2 - Part 1 we introduced the Angular 1 ng1-dinos Single Page Application and migrated the basic app architecture to Angular 2 ng2-dinos. After Migrating an Angular 1 App to Angular 2 - Part 2 we've migrated pages and routing, getting API data, and filtering. Note: Remember that we're migrating an Angular 1 app to Angular 2 with a fresh build. We're not upgrading the original Angular 1 codebase. Our Angular 1 ng1-dinos app shows a dinosaur's details when we click on one in the homepage listing. We'll implement this in our Angular 2 app now. We'll import our new detail component and then add a route with an :id parameter. This route should be placed above the ** wildcard route. We'll use the routerLink directive with the Details button and bind an array of the URL segments: [routerLink]="['/dinosaur', dino.id]". Now we should be able to click on dinosaur Details in the homepage and see our detail component. Our detail component needs to make API calls to retrieve dinosaur data by ID. Let's implement this functionality using a new model and a new observable in the Dinos service. "info": "Allosaurus was an apex predator in the Late Jurassic in North America." We'll import the DinoDetail model we just created. Then we'll create an HTTP observable that accepts an id: number as a parameter. The observable has a type annotation of Observable<DinoDetail>. The ID parameter is passed to the GET request. The handlers we set up in Part 2 are then used for successes and errors. The catch operator will generate an observable that terminates with an error. Now we're ready to get and display individual dinosaur information in our detail component. Most of this should look familiar from implementing our home component in Part 2 of the tutorial. Let's start by importing our dependencies. We need the Title service. We'll also need ActivatedRoute and Params from @angular/router in order to retrieve the route ID parameter to use to get the appropriate dinosaur data from the API. Finally, we'll also need the DinosService and DinoDetail model. We'll create a couple of properties: dino will utilize the DinoDetail model type and error is a boolean, like in our home.component.ts. Then we'll add dependencies to the constructor function so we can use them. The getDino() method iterates over the available route parameters. We'll convert the id string to a number and then pass it to the getDino$(id) observable. We'll subscribe to the observable and assign the JSON response to the dino property. We'll also set the page title as the dinosaur's name. If there's an error retrieving data, we'll simply set the error property to true. Finally, we'll call the getDino() method in the ngOnInit() lifecycle hook. <strong>Rawr!</strong> There was an error retrieving data for the dinosaur you requested. Like with the other page components we migrated, we don't need a .detail-wrapper class in the template. In Angular 1 ng1-dinos we used these classes to "componetize" globally-declared CSS. Angular 2 encapsulates styles by component so we don't need specific wrapper classes anymore. We'll add a link back to the homepage and then finally, show an error message if there was a problem retrieving data from the API. We'll just make one small tweak in the SCSS for our detail component to reduce the amount of extra space above the dinosaur name heading. In the Angular 1 app, the detail page styles were here: ng1-dinos/src/assets/css/scss/pages/_detail.scss. Browse your app to make sure this is working as expected. Our Angular 1 to Angular 2 migration is almost complete! The last piece is a simple loading state that needs to be shown while API calls are resolving. Because we're running our app and API locally, communication between the two is almost instantaneous. In another environment this may not be the case. We'll implement a small loading state to show while data is being retrieved. This will show in the home and detail components. In Angular 1 ng1-dinos, this loading state was a simple directive at ng1-dinos/src/app/core/ui/loading.dir.js. In Angular 2, we'll create a very similar loading component. The first thing we need is the image asset for the loading state. This can be downloaded from the Angular 1 ng1-dinos app here: ng1-dinos/src/assets/images/raptor-loading.gif. We'll place this image in our Angular 2 ng2-dinos app in an equivalent location: ng2-dinos/src/assets/images/. The --it flag is shorthand for inline-template. The --is is shorthand for inline-styles, and --flat indicates a containing folder should not be generated. Note: You can also add --no-spec when generating CLI files if you don't want test files. It's possible to keep everything we need in the component without external template or style files. Instead of using templateUrl we'll use template. The template consists of an image tag with our raptor-loading.gif file. Instead of styleUrls, we can use a styles array and add CSS rulesets right in the component. We'll use an ES6 template string literal (in backticks) to maintain readability. We'll import the LoadingComponent class and then add it to the declarations array. Now we can use the <app-loading> element in other components. The Angular 1 ng1-dinos app shows the loading directive in the home and detail views. We'll add a boolean loading property to track loading state. Loading should be turned off when the API responds either with a success or a failure; we don't want to get stuck in an infinite loading state. We'll add this.loading = false in both the onNext and onError subscription functions. Note: This differs from our implemention in the Angular 1 app: ng1-dinos used the promise method .finally(). When subscribing to observables, the onCompleted function is only executed upon graceful termination of the observable sequence. Unlike finally() with promises, it will not run if an exception occurs. To initiate the loading state, we'll set the loading property to true in the ngOnInit() lifecycle hook. Finally, we need a getter method get isLoaded() to tell the template when loading has completed. Angular 1 ng1-dinos implemented this expression in the template, but the Angular 2 docs recommend moving this kind of logic to the component. We'll add and remove the loading component with <app-loading *ngIf="loading">. We'll also add a container around the rest of the page content and only stamp it if the isLoaded getter is true. The animated gif shows a running raptor until loading is completed. Now we'll make similar changes to the detail component to add the loading state. We'll make the same changes to our detail component as the home component. We want to add a boolean loading property that is true on initialization and false onNext and onError. A get isLoaded() getter compares the loading state to check if it's been set to false and will be used to stamp content in the template. Let's add the <app-loading> element and a wrapper to hide the content while loading is in progress. Now the loading gif should show while we retrieve API data for a dinosaur's detail information. The migration of our Angular 1 ng1-dinos app to Angular 2 ng2-dinos is now complete! If you have both apps running, they should be functionally equivalent from a user's perspective. Please explore the two apps in the browser to make sure that our migration was successful. As with Part 2, you may want to consider using additional @NgModules to manage dependencies. Modules can make dependency management easier. Read the Angular Modules docs and Use @NgModule to Manage Dependencies in your Angular 2 Apps to learn more. You could potentially abstract the template API error markup into its own component. The error message is currently different between the home and detail page components, but you could use data binding to pass a custom string into the component each time it's utilized. This might help with scalability if additional API calls will be made in new components in the future. You'll need an Auth0 account to manage authentication. You can sign up for a free account here. 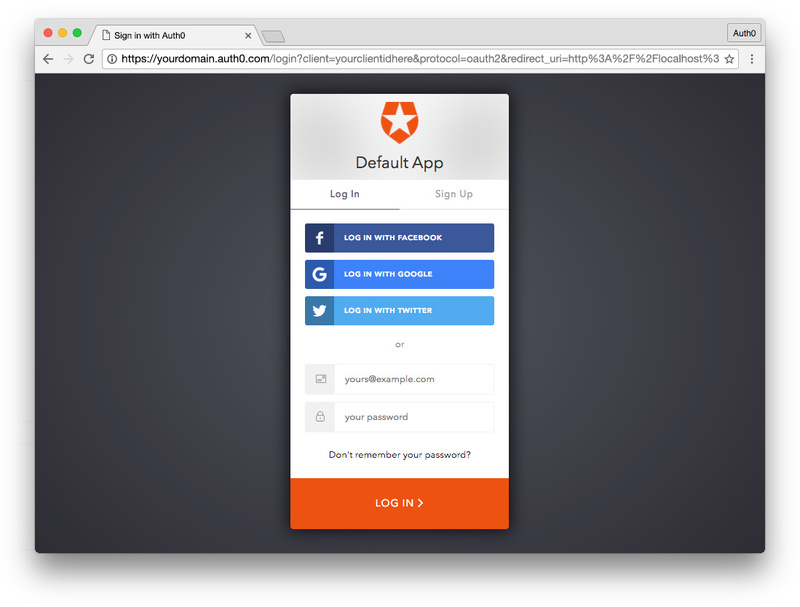 Next, set up an Auth0 client app and API so Auth0 can interface with an Angular app and Node API. In the Settings for your new Auth0 client app, add http://localhost:4200/callback to the Allowed Callback URLs and http://localhost:4200 to the Allowed Origins (CORS). Scroll down to the bottom of the Settings section and click "Show Advanced Settings". Choose the OAuth tab and set the JsonWebToken Signature Algorithm to RS256. If you'd like, you can set up some social connections. You can then enable them for your app in the Client options under the Connections tab. The example shown in the screenshot above utilizes username/password database, Facebook, Google, and Twitter. For production, make sure you set up your own social keys and do not leave social connections set to use Auth0 dev keys. // @TODO: change [CLIENT_DOMAIN] to your Auth0 domain name. // @TODO: change [AUTH0_API_AUDIENCE] to your Auth0 API audience. Change the CLIENT_DOMAIN variable to your Auth0 client domain. The /api/dragons route will be protected with express-jwt and jwks-rsa. Our app and API are now set up. They can be served by running ng serve from the root folder and node server.js from the /server folder. Authentication logic on the front end is handled with an AuthService authentication service: src/app/auth/auth.service.ts file. This service uses the config variables from auth0-variables.ts to instantiate an auth0.js WebAuth instance. An RxJS BehaviorSubject is used to provide a stream of authentication status events that you can subscribe to anywhere in the app. The login() method authorizes the authentication request with Auth0 using your config variables. An Auth0 hosted Lock instance will be shown to the user and they can then log in. We'll receive an id_token, access_token, and expires_at in the hash from Auth0 when returning to our app. The handleAuth() method uses Auth0's parseHash() method callback to get the user's profile (_getProfile()) and set the session (_setSession()) by saving the tokens, profile, and token expiration to local storage and updating the loggedIn$ subject so that any subscribed components in the app are informed that the user is now authenticated. Note: The profile takes the shape of profile.model.ts from the OpenID standard claims. Finally, we have a logout() method that clears data from local storage and updates the loggedIn$ subject. We also have an authenticated accessor to return current authentication status. The callback component is where the app is redirected after authentication. This component simply shows a loading message until hash parsing is completed and the Angular app redirects back to the home page. In order to make authenticated HTTP requests, we need to add a Authorization header with the access token in our api.service.ts file. Our ng2-dinos app is complete! Make sure you've run ng lint and corrected any issues. With clean code, we shouldn't have any errors. We've successfully migrated the dinosaur detail pages and implemented a simple loading state. Hopefully you're now ready to dive into Angular migrations as well as new Angular 2 projects with confidence!